"CERTIFYING THE AUTOMOTIVE PROFESSIONAL" BOB REINHEIMER'S RICHMOND AUTO REPAIR is a FULL SERVICE AUTO REPAIR FACILITY. We perform top quality repair and maintenance operations on your vehicle ranging from a standard maintenance oil and filter change service, to major engine or vehicle repairs, and engine rebuilding or overhaul. We sometimes refer to this as oil change to overhaul!. We have been providing DEPENDABLE, RELIABLE, and ETHICAL QUALITY MAJOR MECHANICAL REPAIRS for over 45 years. This shop started operations in the Richmond District of San Francisco, hence our name. We subsequently moved downtown to the South of Market Area of San Francisco in 1979, and operated our repair facility at 140 Eleventh Street, for 11 years. We moved to our present, and permanent location, at 310 South Van Ness Avenue, also downtown, in the South of Market Area of San Francisco, in 1990. We specialize in, and are EXPERTS at diagnosing ELECTRICAL SYSTEM PROBLEMS. This means that we can diagnose and repair ANY electrical system problem in your vehicle. This may range from diagnosing a vehicle that will not start, because it has a Dead Battery, to determining whether the Ignition Switch, or the Starter Motor has failed. If a vehicle has died in traffic, after performing proper diagnosis, we can determine the cause of the problem, and suggest the proper repair solution. Whether a vehicle has a Dead Battery, or, an Alternator Warning Lamp that is on intermittently, or, that remains on all the time, to a Brake Light, or a Turn Signal Lamp that doesn't operate or flash properly, to a Check Engine Lamp that is on intermittently, or, that remains on all the time, we can properly identify and locate the cause, or source, of the problem. We also specialize in DIAGNOSIS AND REPAIR OF FUEL INDUCTION SYSTEMS. We specialize in the diagnosis and repair of CARBURETERS, and can perform complete diagnosis, service, and repairs to MECHANICAL or ELECTRONIC, or COMPUTER CONTROLLED FUEL INJECTION SYSTEMS. We are a State of California Licensed SMOG CHECK TEST AND REPAIR STAION. 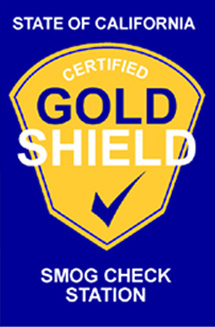 We are also a LICENSED AND CALIFORNIA CERTIFIED GOLD SHIELD AND CAP REPAIR STATION as well. We have been performing Emission System Tests and Smog Checks since the Sixties. We are participating, and doing our share to help keep the air clean, by helping you maintain your vehicle, and it's engine in good operating condition. Keeping your vehicle running well, and in good tune, is a major factor, which is responsible for less air pollution, and cleaner air for all of us. We perform only the highest QUALITY MAJOR MECHANICAL REPAIRS at this facility. Many of our "repeat" customers have been "satisfied customers" for more than 40 years. Some of our customers still own, and have their fifties, sixties, and seventies CLASSIC VEHICLES maintained and repaired at BOB REINHEIMER'S RICHMOND AUTO REPAIR. Many of my original clients children are now driving their own vehicles, and, are now also clients. Technicians are Certified by the National Institute for Automotive Service Excellence (ASE). This means that our clients will receive only top notch, and competent, QUALITY MAJOR MECHANICAL REPAIRS, by our technicians. The expertise of our technicians is important for proper and long lasting repairs. Many years of education, training, seminars, and experience guarantee DEPENDABLE, RELIABLE, and ETHICAL repairs for our customers. Modern test equipment also assures proper diagnosis. Proper diagnostic is performed prior to commencing repairs. Giving proper advice, counsel, and recommendations, to our customer, before repairs are commenced is of paramount concern at BOB REINHEIMER'S RICHMOND AUTO REPAIR. If you have comments or suggestions, please e-mail me (Bob Reinheimer) at vettebob@pacbell.net, or call me at (415) 861-3202. Please ask for Bob Reinheimer.